important as farmers meet with their lender when initiating and renewing loans for 2017. The last three to four years of low farm incomes have resulted in tight cash flows, placing lenders in a much more cautious state of mind. From a lender’s standpoint, just as important as having adequate collateral to back up a loan is the ability to project adequate cash flow to repay existing and new loan obligations. Financial statements will need to be prepared and include an income statement and balance sheet. These two statements measure the business’s profitability for the year just completed and the equity or solvency of the business. Just as important will be preparing a 2017 projected cash flow statement, which provides a measure of the business’ ability to meet debt obligations. The desired result is for the business to demonstrate that it can generate enough cash flow to meet family living needs, pay income taxes and have cash remaining to meet term debt obligations. The Coverage Ratio, which equals cash flow divided by term debt requirements, measures this ability The Coverage Ratio needs to be a at least 1.0 but ideally a higher ratio is preferred to allow for any unexpected shortfalls in the projected cash flow. These shortfalls can come about due to lower prices, lower yields and/or higher costs than what the original projections used. The two major components of the coverage ratio are the Capital Debt Repayment Capacity (CDRC) and the Annual Debt Service Requirements (ADSR). 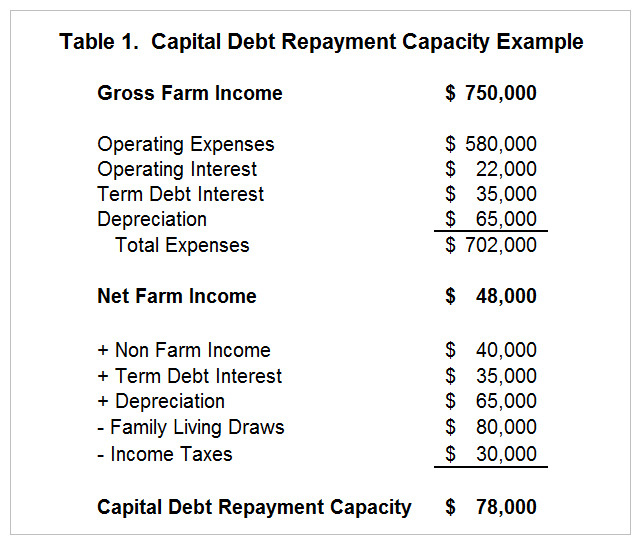 Table 1 illustrates the calculation of Capital Debt Repayment Capacity. The starting point in calculating CDRC is the projected net farm income from the business. Adjustments are then made by adding in non-farm income, term debt interest and depreciation. Term debt interest is added back because it is part of the Annual Debt Service Requirements. Depreciation is added back because it is a non-cash expense. Family living draws and income tax expense are subtracted out in arriving at CDRC. Table 2 illustrates an example of Annual Debt Service Requirements. This is basically any term debt obligations that need to be paid out of the projected cash flow for the year. Once these two components have been calculated, the Capital Debt Repayment Margin and Coverage Ratio can be calculated. The Capital Debt Repayment Margin is simply CDRC minus the ADSR. The Coverage Ratio is calculated by dividing the CDRC over ADSR. In Table 3, the Capital Debt Repayment Margin is $8,985. The Coverage Ratio is 1.13, which is above the 1.0 benchmark. This means that the business is projected to generate enough cash flow to meet its debt servicing requirements. Most lenders will require a higher Coverage Level than 1.0 to provide cushion in the cash flow. Different lenders will have different minimum Coverage Ratio requirements. However, it would not be uncommon to have a minimum Coverage Ratio requirement of 1.15 or 1.20. While 1.15 and 1.20 is considered adequate, a Coverage Ratio of 1.50 or higher is considered good. In today’s agricultural economy with lower grain prices, some farm operations may be projecting a Coverage Ratio of less than 1.0. In 2015, the Coverage Level averaged less than 1.0 in Illinois (farmdoc daily, October 4, 2016). If this is the case, the next question is how much is the shortfall and does the business have adequate working capital to cover the shortfall. This maybe a short-term solution but depending on the magnitude of the shortfall and level of working capital might not and should not be a long-term solution. If the business does not have the financial strength to cover the shortfall, then the borrower and lender need to analyze the projections to see if some adjustments are possible to achieve a Coverage Ratio of 1.0 or higher. If adjustments in gross revenue or expenses cannot be made to obtain an acceptable Coverage Ratio, other alternatives such as liquidating assets to pay down debt or refinancing debt to lower annual debt service requirements may need to be evaluated to see if the annual debt service requirements can be lowered to project a positive cash flow. Schnitkey, G. "Financial Performance of Illinois Grain Farms: Deterioration in 2015." farmdoc daily (6):187, Department of Agricultural and Consumer Economics, University of Illinois at Urbana-Champaign, October 4, 2016. Should Sweat Equity be Used to Compensate a Returning Family Member?